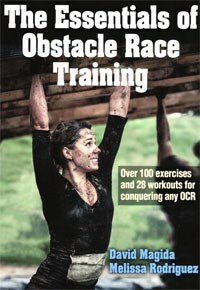 The Essentials of Obstacle Race Training is the perfect title for this book. It is a beginner's guide to participating in obstacle races. Both of the authors have competed in these events. • David Magida is the founder and general manager of Elevate Interval Fitness, which offers obstacle race classes. He holds a fitness certification from the American Council on Exercise (ACE) and is a Spartan group exercise instructor. He has competed in dozens of obstacle races beginning in 2011 with 25 podium finishes. Magida was one of the first 10 men in the US to receive Professional status as an obstacle race competitor. Prior to becoming an obstacle racer, he was a triathlete. He is a member of the Spartan Race ProTeam and the host of "Spartan Race" on NBC Sports. • Melissa Rodriguez, MBA is a fitness trainer and obstacle race enthusiast. She holds a personal training certification from the National Academy of Sports Medicine (NASM) and a Certified Strength and Conditioning Specialist (CSCS) certification from the National Strength and Conditioning Association (NSCA). Her undergraduate degrees are in biology and English and she holds a Masters in Business Administration. Since 2008, Rodriguez has served as a research analyst, writer, and project manager for the International Health, Racquet & Sportsclub Association (IHRSA). She is the author of the book 12 Weeks. 22 Workouts. Your First Obstacle Race. In general, I liked this book. It covers pretty much every topic relevant to training and preparing for an obstacle race. The authors address risks and injuries, a little bit of exercise physiology, nutrition and hydration, and what gear to wear. They also give the reader a perspective on some of the obstacles they will encounter. I especially liked Chapter 14, even though it was only four and a half pages long. Here, they offer advice for handling the self-doubt that will inevitably occur at some point during a race. The Essentials of Obstacle Race Training is strong on providing specific exercises. Many exercise books provide a list of exercises, but this is the first one where I have seen a variety of exercises to improve grip strength. They devote an entire chapter to this. • Chapter 1: This chapter introduces obstacle races to the reader and briefly lists some perceived benefits and some realistic risks. • Chapter 2: This chapter presents a brief overview of exercise physiology. • Chapter 3: This chapter reviews exercise gear you should consider before entering an obstacle race. In general, it is good information, but it would have been more useful if they had gone into more detail...ie., identify specific brands. For example, they tell the reader that shoes can get very heavy when water-logged....what brands are better than others? For getting a proper fit, mention the "Shoe Dog" service that RoadRunner Sports offers. On p. 35., there is a photo of a "fuel belt"....pretty cool, but who makes it? Are there any other brands or types? • Chapter 4: This chapter is devoted to nutrition but missed the mark. The first 10 pages cover "nutrition basics." As stated, the information here is not specific for obstacle racing. This discussion may or may not be useful to the reader. Why does an obstacle racer need to know about daily fiber intake, for example? The discussion of Vitamins and Minerals offers no useful information. Table 4.2 provides a nice list of food sources for each vitamin and mineral, however, the recommended daily intake for 10 of the 27 micronutrients in this table displays a serious typographical error in the units-of-measure: it lists "grams per day" instead of "micrograms per day", a 100,000-fold overdose. With regard to nutrition recommendations more specific for athletes, the authors provide an interesting table (Table 4.1) summarizing the Glycemic Index and Glycemic Load ratings of specific foods. However, the reader is uncertain how to use this information. On p. 53, the authors state "...it is recommended you consume an energy gel about every 45 minutes" during a race. What is the Glycemic Index and/or Glycemic Load of energy gels? On p. 39, the authors state: "...athletes have been told to eat sources of low-glycemic carbohydrate before a long training session" but later state "...there is not enough research to show that consuming low glycemic-index carbohydrate before an endurance event contributes to superior performance." In general, the discussion of carbohydrates needs better clarity. The discussions of water intake and alcohol are pretty good, but the authors perpetuate the myth that caffeine is a diuretic. Their discussion of dietary supplements BCAA's, chondroitin, and glucosamine should have been omitted. Dietary supplements are a can of worms and can't be dealt with properly in the several paragraphs they devote to this topic. Instead, a more thorough discussion of sports drinks and sports gels should have been presented. • Chapter 5: This chapter introduces the reader to specific obstacles they might encounter. It's somewhat helpful, but, there are more detailed lists of obstacles on the web sites for Savage Race, Spartan Race, and Tough Mudder. The authors provide tips on "how to conquer it." These are helpful. • Chapters 6, 7, and 8: These 3 chapters present specific training exercises. These include small color photos of people performing each exercise. These are well done. • Chapter 9: Chapter 9 is also devoted to training exercises, but, I wanted to highlight it. No doubt, grip strength is important in an obstacle race! And Magida and Rodriguez have given it a lot of thought: they break it down into "crush grip" (the force generated between your fingers and your palm), "pinch grip" (the force generated between your thumb and fingertips), and "support grip" (strength required to carry or hold something for long periods of time). Who knew?! • Chapters 10 and 11: These 2 chapters present training plans. Generally, these are well done. • Chapter 12: This chapter provides the reader with some helpful tips for choosing their first race. Generally, this information is good, though, their discussion of specific race organizations was surprisingly brief (see below). • Chapter 13: This chapter reviews injuries. It's always a bit dicey to offer advice on the management of specific medical problems, however, there is useful information here. • Chapter 14: This chapter covers the mental aspect of participating in an obstacle race. This chapter is done well. • Photos & Illustrations: Throughout the book, there are large color photos of athletes competing in obstacle races. Smaller color photos are also included for each of the specific training exercises. There is one illustration. It appears in Chapter 2 and explains the energy systems used by the body at different levels of intensity. This is the best diagram of this aspect of exercise physiology I have seen. • Tables & Graphs: There are several tables in the book. The information they provide is good, but, they are printed in "reverse" font (white letters on a blue background). Readers should disregard the daily intake recommendations for vitamins and minerals in Table 4.2 due to the typographical error described above. • Documentation: This is not a scientific book, however, several research citations are provided where appropriate. The book offers useful, practical advice, yet does so succinctly. The discussions are short and to the point. And, the subheadings make it easy to look up specific information. Aside from the Tables, the presentation is also well done. There are lots of large color photos of people competing in obstacle races. Color photos are also provided to show how to perform the various exercises. The main body text is presented in a sans-serif font. I always prefer a serif font for main body text, but, the sans serif font is large enough and bold enough to make reading this book easy on the eyes. As mentioned above, the Tables are printed in reverse font. I have never been a fan of reverse font...it's harder to read. And, if someone wanted to photocopy these tables to keep track of their progress, you couldn't make entries on them. For example, Table 6.1 is a monthly calendar. Only one-third of the cells in this table contain text; the rest are simply blue rectangles. The Essentials of Obstacle Race Training offers lots of useful information for a first-time obstacle racer. The authors write from personal experience. Magida's race results validate the training advice. And, the book is easy to read. Although this is the first book I have read on obstacle races, and, despite the deficiencies in the nutrition chapter, I have no hesitation giving it 4 stars. If you are contemplating entering an obstacle race, I can recommend this book.